This is my last rhubarb post for the year. 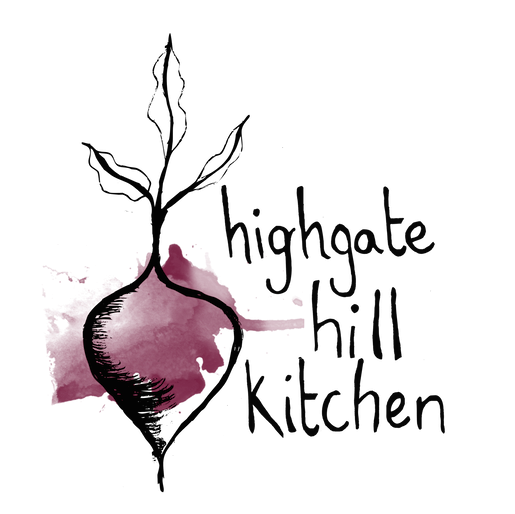 I do love rhubarb; its tartness, its vibrant colour, its all-round deliciousness. But the weather is starting to get warmer up here in Brisbane and new fruits are beginning to appear at the market, so I think I’ve had my fill of rhubarb till next year rolls around. 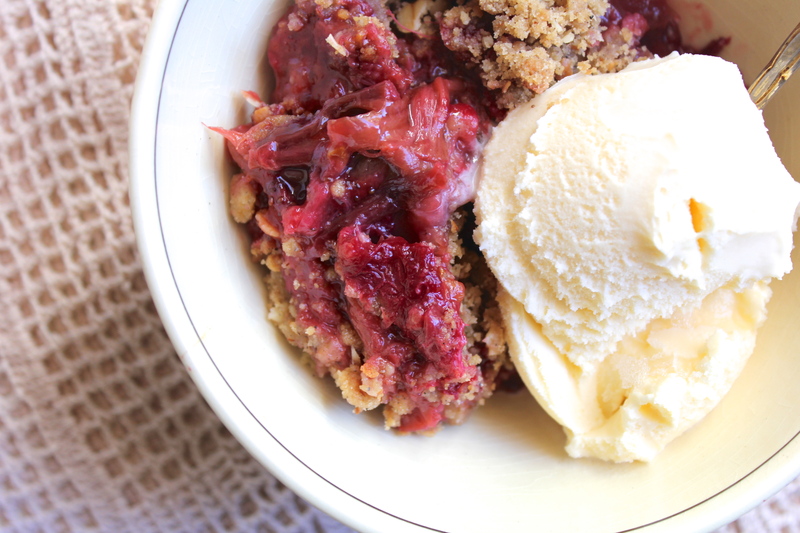 This is a straight up crumble – easy to make and the perfect comfort food. Though I usually try and use coconut or olive oil in much of my baking these days, when it comes to crumble I’m all about the butter. 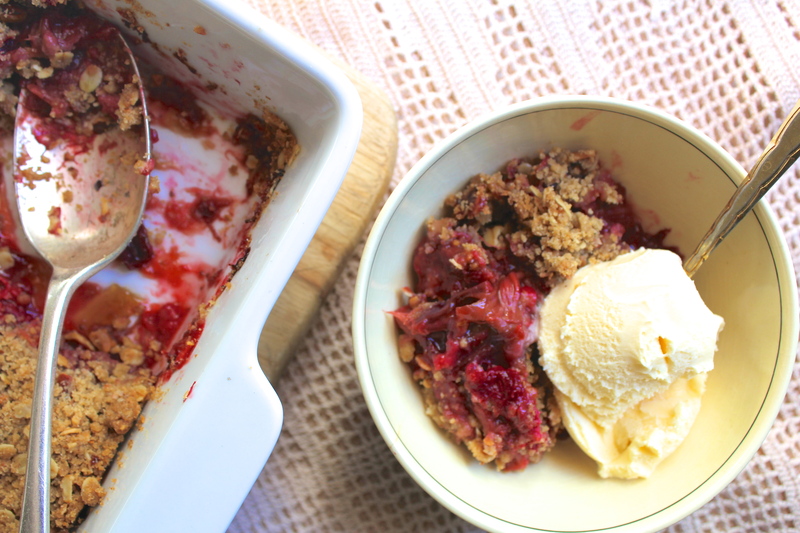 I’ve tried it a few different ways, but I just think buttery-crumble is superior. I’ve spiced this particular crumble up with a little rosewater and cardamom, but I’ve made an equally delicious version replacing the rosewater and cardamom with the rind and juice of one orange, or even by replacing the ground almonds with ground hazelnuts. 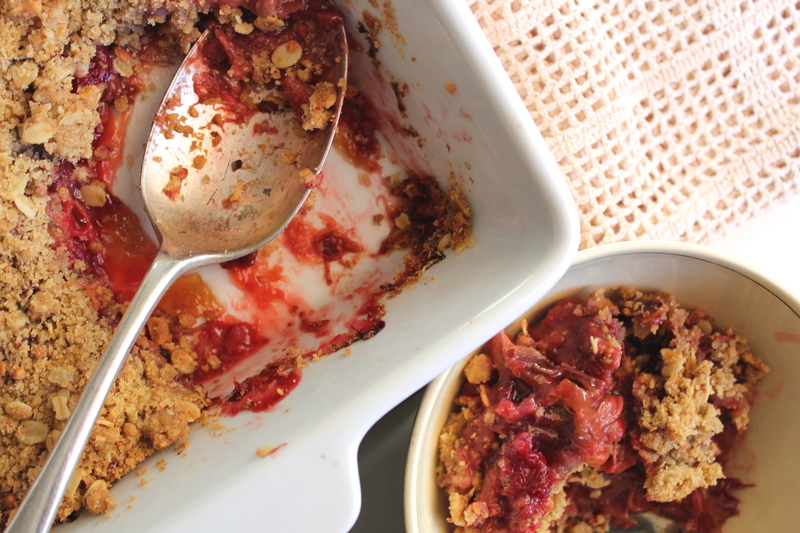 Unlike a lot of other baking, making crumbles isn’t an exact science, so go ahead and experiment! Pop this in the oven when you sit down to dinner and while you’re eating the whole house will start to smell of sugar and flour and butter melting. 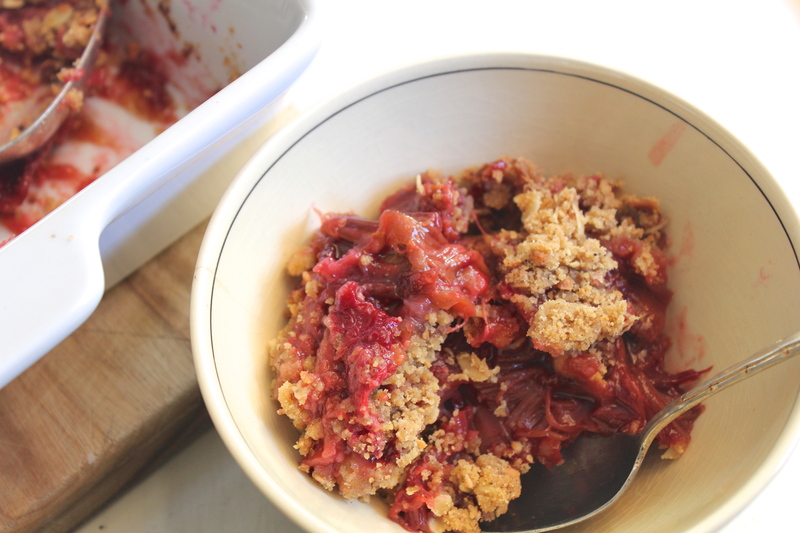 When you go to get it out, the juice of the rhubarb should be bubbling up red and rich in amongst the crumble. Top with a generous scoop of vanilla bean ice-cream, and happiness. Chop the rhubarb into large chunks (approx. 3cm), remove the stalks from the strawberries and cut in half, and core and slice the pear. 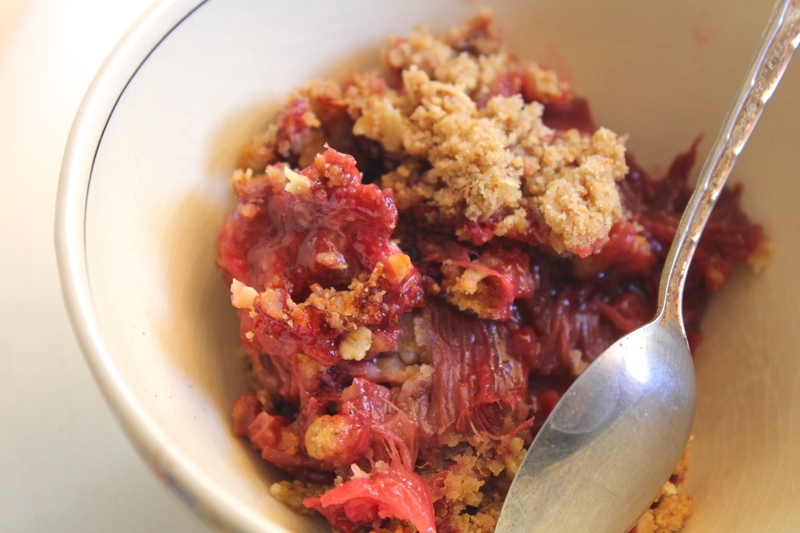 Combine the fruit with the rosewater, arrowroot powder and sugar and leave to sit while you prepare the crumble topping. In a large bowl combine the flour, sugar, oats, cardamom, almonds and salt. Chop the cold butter into cubes and add to the bowl, using your fingers to work the butter through the flour mixture until it resembles coarse crumbs. Don’t worry if the ‘crumbs’ aren’t all an even size, just as long as there are no large chunks of butter. In a ceramic or glass baking dish with deep sides (mine is 22 x 20 cm) spread the fruit mixture along with its juices into an even layer. Using your hands, spread the crumble over the top making sure it reaches into all the corners and edges, gently pressing down with your fingers. Bake in the preheated oven for 40 minutes, or until the top is golden brown and the fruit juices are bubbling. Serve hot, with scoops of vanilla bean ice-cream (if using). Yep, this is just about my favorite kind of dessert, especially with the rhubarb. I love your crumble topping with cardamom and rose water, and I agree a butter crumble is superior. So glad you enjoyed – and happy birthday Katie!